Sambo Reefs is a large system that's divided into three reef regions - Eastern, Middle and Western. These reef sections are separated by large sandy areas. Also, each reef has somewhat of a different structure therefore attracting different marine life. It's these variances in depth, structure and marine life that act as a magnet. The combination draws a complex variety of Florida fish into the area. 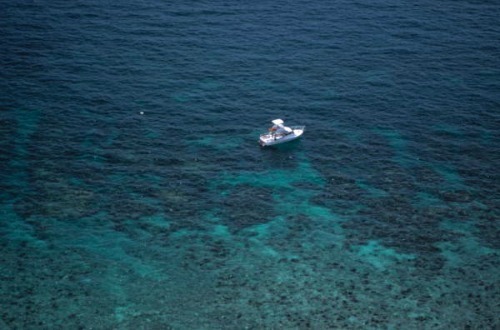 This in turns attracts those avidly interested in one of the better reef sites for snorkeling Key West. The Eastern Sambo section is a good example of spur and groove reefs with numerous ledges, and very healthy coral. 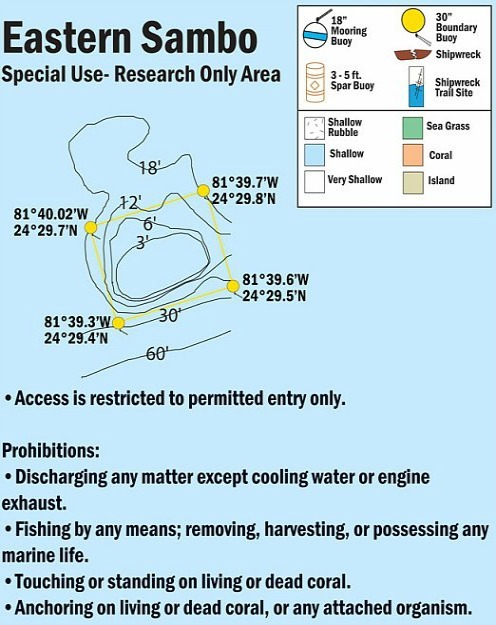 It also contains the Florida Keys National Marine Sanctuary Research Only Area. The area is well marked with yellow buoys to visibly highlight the area that is closed to entry. Scientists operating within this Research Only Section have benefited from the 3 reefs being close to each other. This proximity has made it possible for the scientists to easily study different impacts on Florida Keys coral reefs, including the human element. The Middle Sambo section is surrounded by large white sandy areas which separate it from the Eastern and Western Sambo reefs. This reef also has a more highly defined coral reef structure than the outer two. 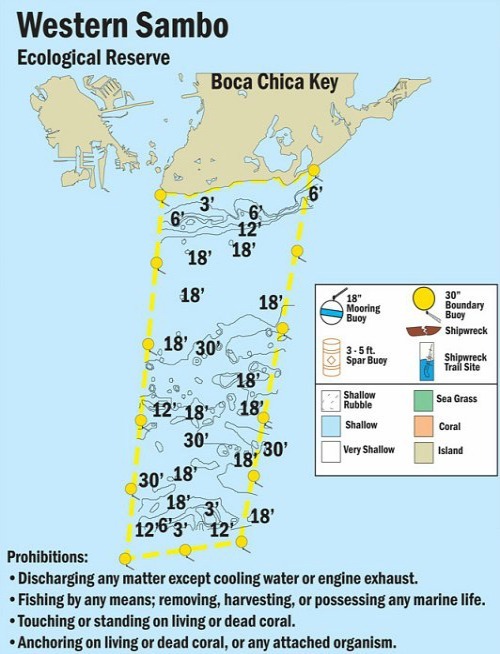 The Western Sambo section covers 9 nautical square miles and is 1 of the 2 Florida Keys National Marine Sanctuary Ecological Reserves. Reserves are different from Sanctuary Preservation Areas in that they encompass a much larger area. This makes it possible to protect a broader spectrum of Florida marine life and habitat. The Reserve begins at water's edge at Boca Chica Naval Air Station. It then stretches over a variety of marine terrain that covers salt ponds, near shore hard bottom, and inshore patch reefs. In this aquatic habitat you'll discover a variety of sea life including anemones, crabs, starfish, sea cucumbers, sand dollars and sea urchins. The Reserve then continues out into Hawk Channel where it includes the mid-channel reefs where surgeonfish, butterflyfish, and a host of other tropical fish live. It then stretches further out to cover offshore patch reefs and shallow bank reefs where grouper, large angelfish, barracuda, hogfish and nurse shark swim. The area is known for it's many different channels, fingers and diving points of interest. The depth of the Reserve starts at 0 feet and ends at 60 feet. Obviously such a vast range of habitat accommodates a tremendous variety of marine life. This is why setting up a large protected area is so vital. It gives scientists a good working lab where they can make "real life" comparisons to what is happening outside the protected zone. An interesting section of the Western Sambo reef is located on the east side and is a channel called Cannonball Cut. Here you'll discover numerous spiny lobster, and giant star coral. This is also where The Aquanaut tugboat wreck is located. Another popular scuba diving Key West hot spot at Western Sambo, is Haystack. Here you'll find a vast selection of different species of tropical fish happily thriving. In the grassy bed areas of this Florida reef you'll also discover large fields of brain coral. This reef is also the location of one of the last, and certainly the largest stands of elkhorn coral found in the Lower Keys. This reef system is particularly colorful as they contain an incredibly broad spectrum of tropical fish, and large, healthy coral. This makes this an excellent choice for Florida Keys snorkeling and diving and for anyone interested in underwater photography. It also makes a good second reef diving site for anyone who's been Key West diving on either the massive Vandenberg Wreck, the Cayman Salvage Master or Joe's Tug.